Shaker furniture demonstrates a concentration on simplicity, form and functionality. 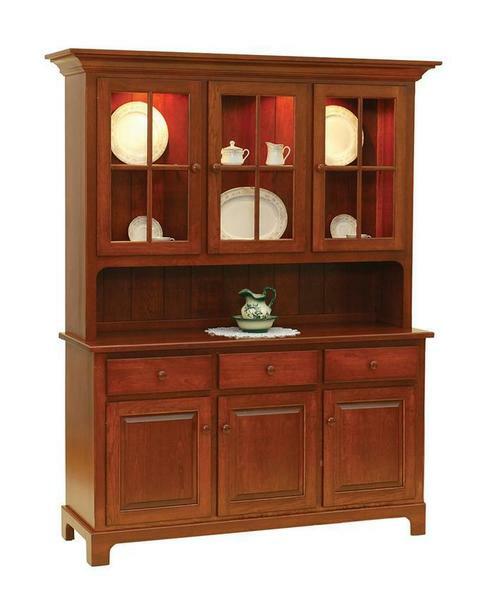 The Amish Shaker 3-Door Hutch possesses all three of those concentrations of traditional Shaker furniture. The Amish Shaker 3-Door Hutch comes with a wide variety of standard features such as: 3 dovetailed drawers with full extension soft closing drawer slides, glass shelves, touch lighting, and a solid tongue and groove back. Customers also customize this hutch by choosing their wood and finish selections, along with hardware and door style. Mirror backs and silverware inserts are also available as upgrades. Give us a call if you have any questions about this Amish Shaker 3-Door Hutch or visit us in Sarasota, Florida at our Amish furniture store. We are delighted! Look how beautifully it matches the dining room table. Very well made product with plenty of storage space for dishes table cloths and napkins. Will provide many years of good service.